It is easy to make at home. In few steps the result will surprise you. With condensed milk can make many variety of desert recipes. It only takes a few ingredients to make your own homemade condensed milk. It is a more natural and healthy way to make this recipe. This is a homemade version and its a great substitute of milkmaid. 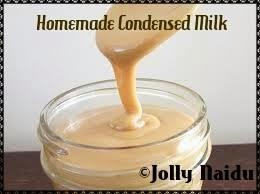 See How to make Sweetened Condensed milk at home. 1. Take a non-stick pan. First boil milk. When milk starts boiling, add sugar and baking soda in it. Keep on medium flame and stir it properly. 2. Now keep stirring every 2-3 mins, till milk is reduced to 1/3rd of its quantity. To check whether your condensed milk is ready or not, put few drops on a plate. 3. After it cools down, touch with your finger. If it sticks to your finger and one string consistency is formed. 4. At this point turn off the gas, and your condensed milk is ready, otherwise after cooling it will become hard. Here you can add butter in milk and mix it well to thicken the condensed milk. 5. After cooling keep condensed milk in airtight container in fridge. We can keep in fridge for 2-3 weeks in airtight container. Generally we get 450-500 grams condensed milk from 1 liter milk.